Review of J.W. Lees Limited Edition 2007 Harvest Ale (Calvados Casks) | Beer Apprentice - Craft Beer News, Reviews, Interviews and Info. Hi guys. For today’s craft beer review I’m going to be cracking open another J.W. Lees brew from the J.W. Lees & Co. Ltd. Brewery (Greengate Brewery) in Middleton Junction, Manchester, United Kingdom. This one is the 2007 Harvest Ale matured in Calvados Casks. Let’s refresh our memory of what the website, jwlees.co.uk, has to say about these brews. Matured in wooden Etienne Dupont Calvados casks from the end of October until mid March. This fully fermented ale has been brewed by JW Lees as a celebration of the brewers’ art. 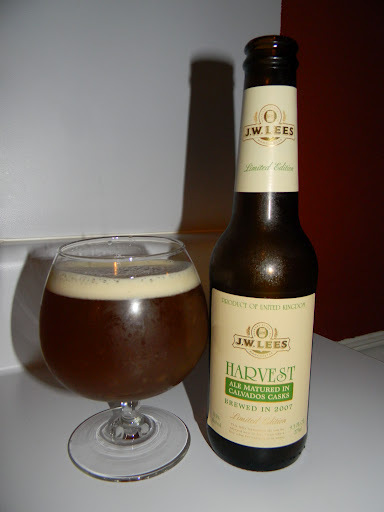 Harvest Ale can be enjoyed now or laid down like a fine wine for enjoyment to come. After that description I’m ready to drink. How ’bout you? This brew comes in a 9.3 oz. bottle and it has an ABV of 11.5%. It poured a muddy, amber to burgundy color with quite a bit of sediment accidentally deposited from an aggressive pour on my part. The head was meager and light tan in color. The retention was ok as was the lacing, but the alcohol legs were very prevalent and attractive. The nose….. Wow!!! Right off the bat I got some of that expectant J.W. Lees goodness. Very malty with hints of caramel and toffee sweetness. Toasted breads, biscuits, oak, syrup and booze (Brandy). As I studied the aroma a bit more I began to pick up tones of apples and other light fruits. Awesome!!! A truly outstanding and beautiful aroma. It was balanced and blended so well. I just kept sticking my nose in the snifter to take it all in. As I was anticipating, I got tons of malt in the taste as well. Savors of caramel and apples. It was very similar to caramel apple dip. Tasty!!! Some toasted bread and biscuit aspects, however they seemed a touch more relaxed than they were in the bouquet. The alcohol was definitely noticeable, but it was quickly covered and harmonized by the other characteristics. Most notably the light fruits (apples). Flavors of oak and wood played a supporting role at the back end to give it that earthy/round taste. It was of medium strength on the sugary sweetness, which, in turn, let those malts really stand out. The mouthfeel was medium bodied. Incredibly smooth, slick and nicely dry. Quite possibly the smoothest J.W. Lees Harvest Ale I’ve had to date. Very little carbonation was to be had, but a small dab of warmth and an excellent dose of flavor was left covering the palate long after each sip. There was a ton going on with this beer. Outstanding to say the least. I absolutely loved the apple relishes combined with the malt, booze and wood. It’s most definitely a sipper, however that’s how I like it because it forces me to take my time and really digest all that this beer has to offer. All this beer does is just reaffirm my love for J.W. Lees Harvest Ales. That’s about all that needs to be said really. If you guys have yet to try a one, I’d suggest picking one up of any vintage and of any variation. They are all incredible in my opinion, but this 2007 version matured in Calvados Casks is really something. Be sure to let me know what you think if you have the opportunity to sample it. I would love to hear if you have the same affection for them that I do.